Our niece, Kelly, has a pretty impressive zip code. I mean, when you have Dolly Parton and Trisha Yearwood for "neighbors", that is a bit out of the ordinary, right? So, all it took was a text message from Kelly, suggesting a family girls' getaway, to get us all headed toward Rocky Top. Our mildly scattered family was coming in three cars, from three different directions. Janet and Martha Jo were coming from west Tennessee. Martha Jean, Linda Ruth, Patty and Holly were leaving from Arab and I was headed north-west from Scottsboro. Emily, our niece who also lives in Nashville, was meeting us as well. Our first destination was Puckett's Boathouse in Franklin, for dinner. As luck would have it, and against all odds, I was the first to reach Puckett's. I am documenting this in case anybody accuses me of always being last. I was FIRST! Everybody else arrived pretty soon after, with the exception of the Arab car. They got caught up in a traffic jam, which probably helped secure my first place finish. Puckett's Boathouse began life as Puckett's Grocery back in the 50's. Locals could stop by, pick up their groceries and fill up the car with a tank of gas. Over time, the little grocery that could began serving meals. The meals were so popular, the owners realized the business was really more restaurant than grocery store, so Puckett's Restaurant was born. With five locations and incarnations in and around Nashville, Puckett's has really evolved. 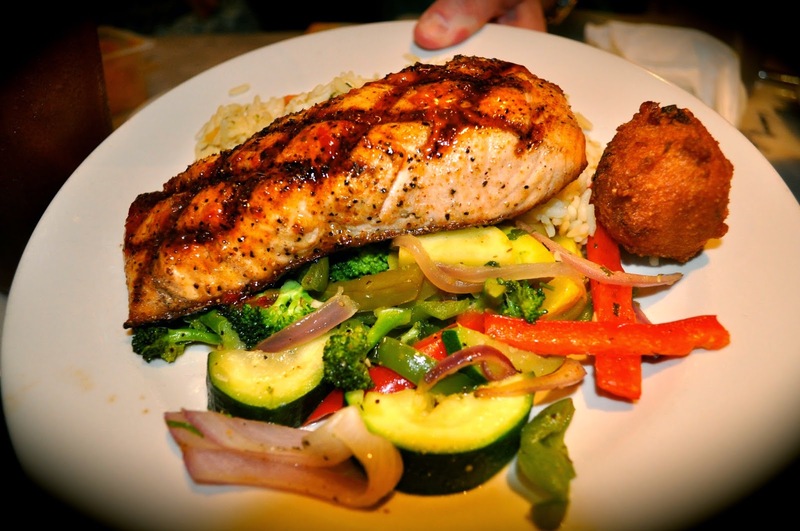 The Boathouse is the Puckett's restaurant that specializes in seafood. As I mentioned, Puckett's Boathouse is primarily a seafood restaurant, so most of our entrees featured seafood of some kind. I say most, because there is always an exception. 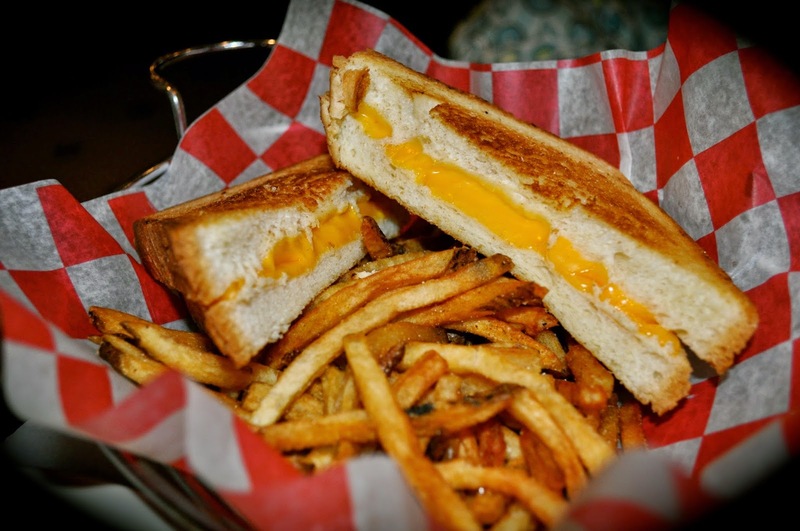 Our exception was Kelly's and Ava Reed's grilled cheese sandwiches. Hey! It's what they like and it was a girls' party...we get what we want! 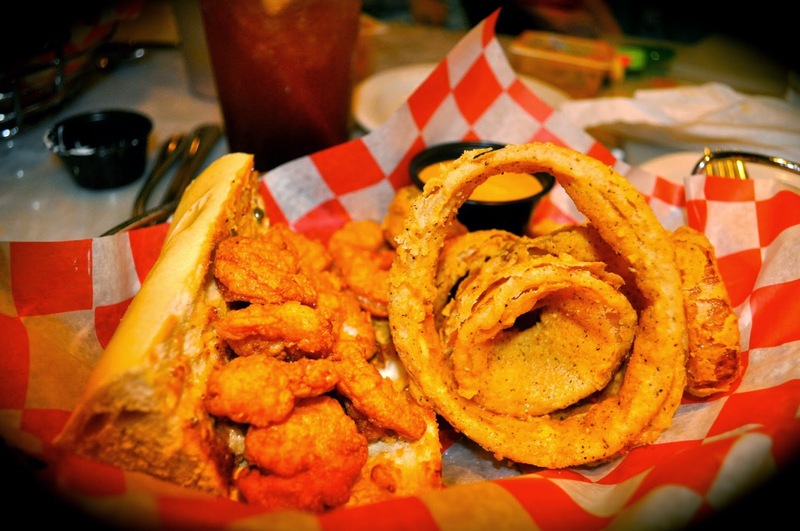 Martha Jo ordered a shrimp poboy with onion rings that looked really crunchy and wonderful. The bun was packed with crispy, fried shrimp and was accompanied by a creamy remoulade sauce. 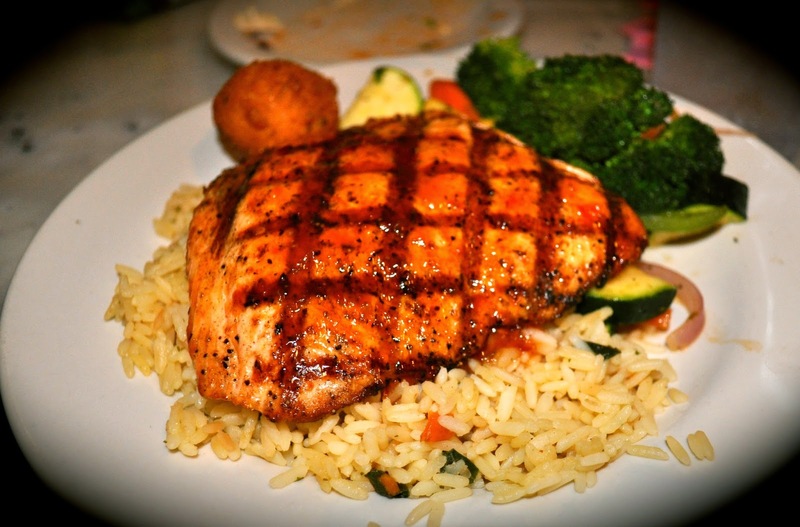 Buh (that's what we all call Martha Jean) and Janet ordered perfectly marinated and grilled Sanibel salmon topped with some more of that sweet mango pepper glaze and served with rice pilaf and sautéed fresh veggies. 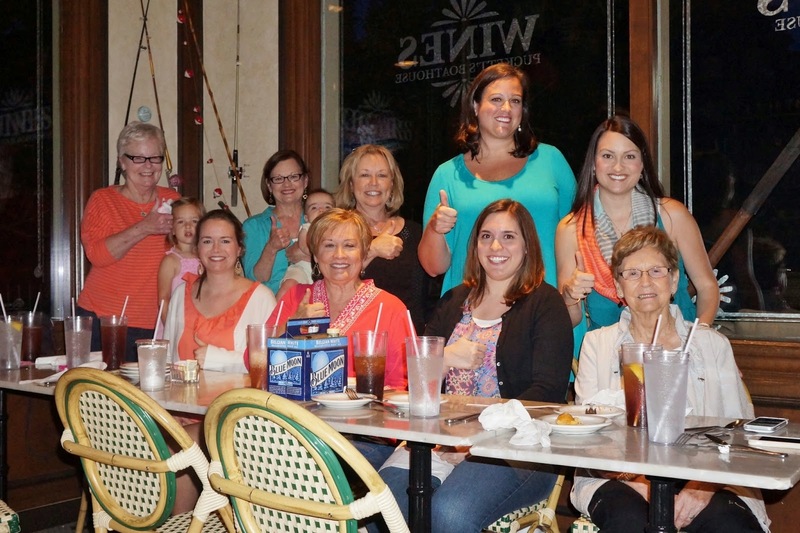 The grilled Mahi-Mahi, chosen by Emily and Linda Ruth, was equally well received. The grill marks on both of those fish dishes were gorgeous! Patty's Sandestin Salad with grilled shrimp almost tempted me, but in the end I chose something else. (More about that later.) The delicious looking salad was made with crunchy iceberg and romaine lettuce topped with black bean and corn relish, pico de gallo, tortillo strips, homemade guacamole, and drizzled with a citrus vinaigrette dressing. Patty said it was really good, with her only criticism being that the citrus dressing might have been a tad too citrusy for her taste. I'm not sure I have ever had anything that was too citrusy for me! Holly ordered the shrimp and grits. She enjoyed them very much. 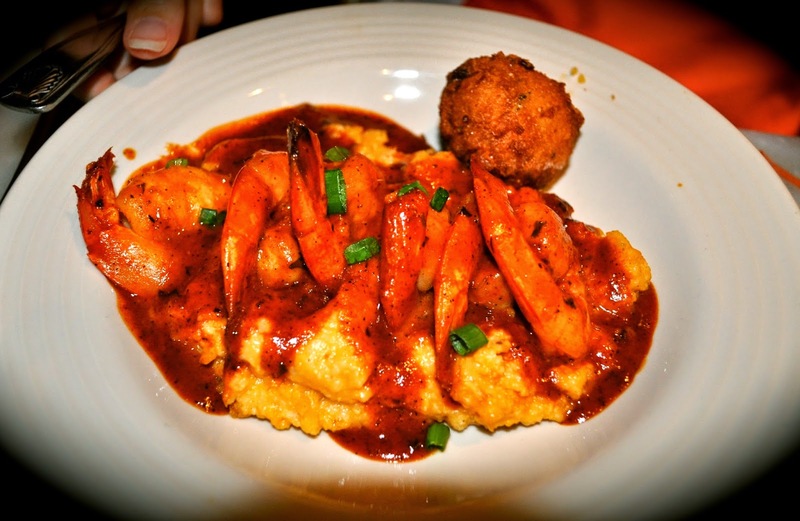 The shrimp were large and fresh, the grits creamy and swimming in a spicy barbecue sauce. So, what did I end up with. Well, as I mentioned before, I really liked that creamy slaw and sweet, spicy mango pepper relish that came with our hushpuppies, so I could not resist when I saw that the grilled shrimp tacos also came accompanied by those two yummy concoctions. 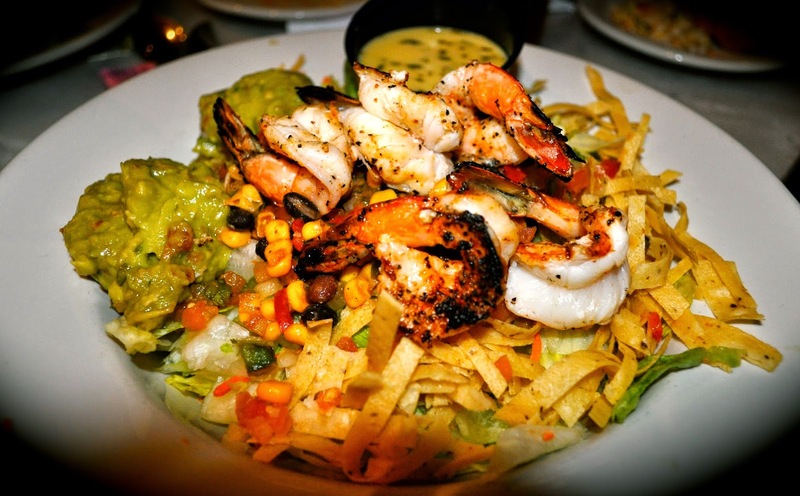 I know what you must be thinking if you have read any of our previous blog posts..."She always gets shrimp tacos!" While I will be the first to admit I have written more than my share of shrimp taco reviews, it really was the coleslaw and relish that got to me this time. 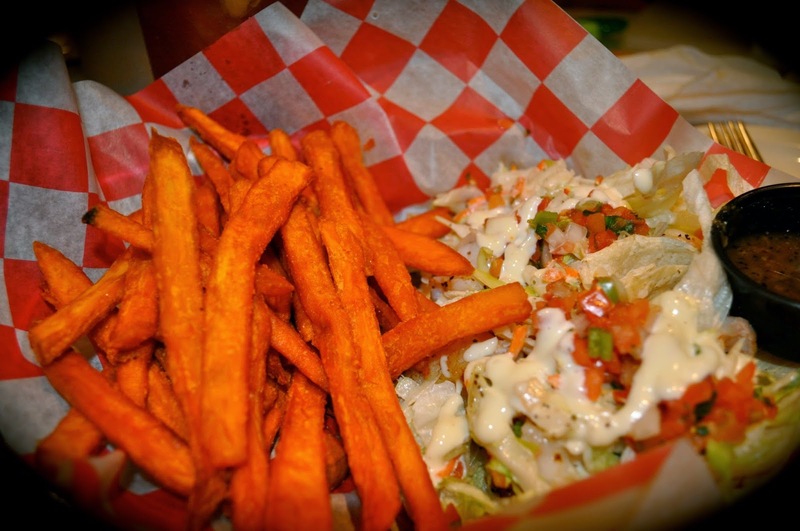 And the fact that the tacos were also paired with another of my personal favorites, sweet potato fries, really sealed the deal. But, I do love some good shrimp tacos! Our visit to Puckett's Boathouse was a great way to kick off our adventure in Franklin and over into the Brentwood suburb of Nashville. Next up, the Franklin adventures continue with a trip to The Factory, Saffire Restaurant and Honey's Candy store. Stay tuned! Three Friends and a Fork and all of the ladies in our family give Puckett's Boathouse 3 Girly Yums UP!